When Life Throws Blocks at You. Chaim Boruch’s walking has regressed from the seizures and the toll of the medication he is on. He is unable to return to school after a very long winter break. He refuses to use his walker and he is unsteady on his feet. Yet, this extra time with him at home has given me a special closeness as I go through his day with him, by his side. I finally found the perfect big building blocks that wont harm him when they fall…and besides the hour it took me to actually build the blocks…we really had so much fun! I am amazed yet again at the dedication, commitment and perseverence that my child has. I am in awe at the strength. The inner strength inside his soul and his physical strength as well. It took so much effort to use both of his hands. 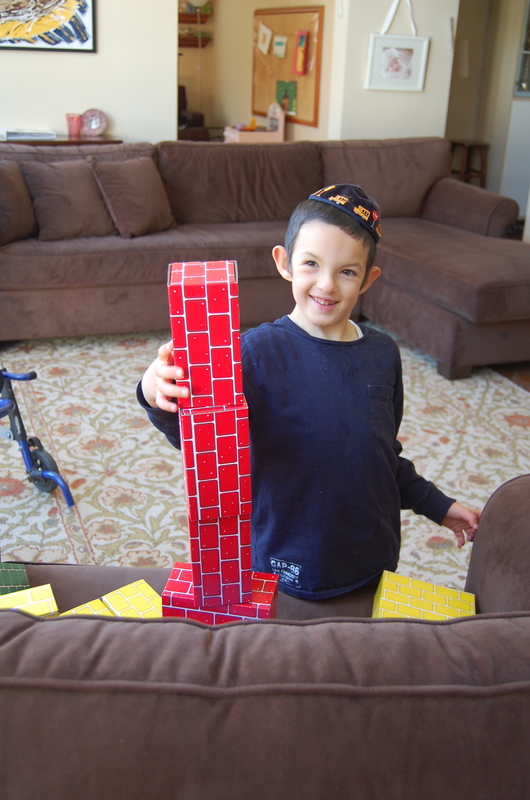 It took so much concentration for him to get each block stacked up on another. I paused next to him for a brief moment while the tower swayed gently, yet remained in tact. How simillar this moment was to my challenging days. Sometimes the hardship sways…sometimes it looms foreboding above me…and sometimes it crashes to the ground…to be built again…and again. Yet other times, the challenge stands tall. It serves as an outstanding example to the journey. It becomes part of a beautiful landscape.